This is a common dilemma for entrepreneurs. You’ve got big dreams, big plans, big goals, but figuring out how to make it your reality is often the tough part. So you try a little of this, and a little of that, trying to figure out what works. But that approach is time-consuming, resource intensive, and often filled with a lot of trial and error. If you want to be a successful entrepreneur, there are 3 skills you must master: customer intimacy, customer acquisition (lead generation), and customer loyalty. The great news is that choosing to go deep with customer intimacy will open the door for you to get customers consistently, and earn their loyalty more effectively. That’s why entrepreneurs who embrace building relationships with their customers have an unfair advantage. But even though getting to know your customers at a deep, personal level is so impactful, many business owners struggle to connect the dots to see how to actually use it to help them to grow their businesses. So here are four practical examples of how you can use customer intimacy as fuel to get the results you want. Communication is a lost art. But doing it effectively is essential to build the kind of relationships with your customers that will enable your business to thrive. That’s because talking with your customers is one of the primary means in which you build intimacy with them. Here are four ways talking to your customers can help you grow your business. It is sooooo easy to fall into a trap of thinking you know exactly what your customers need and then feverishly running off to create products and services that you think are perfect. But to build a business that customers love to buy from, you’ve got to create products your customers want to buy, rather than the ones you want to sell. Cool commercial. But the car flopped. The problem was that “perfection” was defined by Fiat Chrysler and not the customer. Then a price was slapped on, and Dodge took it to customers to try to sell it. No bueno. Not good at all. Contrast that with another auto company that took a customer-centric approach. In the early 2000’s luxury car maker Porsche introduced their Cayenne SUV, their first product within this segment. Porsche surveyed target customers on every single feature the car might possibly have, and gauged their willingness to pay for those features. It turned out that customers were willing to pay for sportiness (a missing dimension of competing SUVs). They wanted power and handling near to what they would get in a sports car. But they were not interested in the six-speed manual transmission for which Porche’s sports cars were famous. So the designers threw that out – not an easy sacrifice for the engineers at a performance-driven company like Porsche. And the Cayenne’s designers put in place foreign (to Porsche) featues like big cup holders. 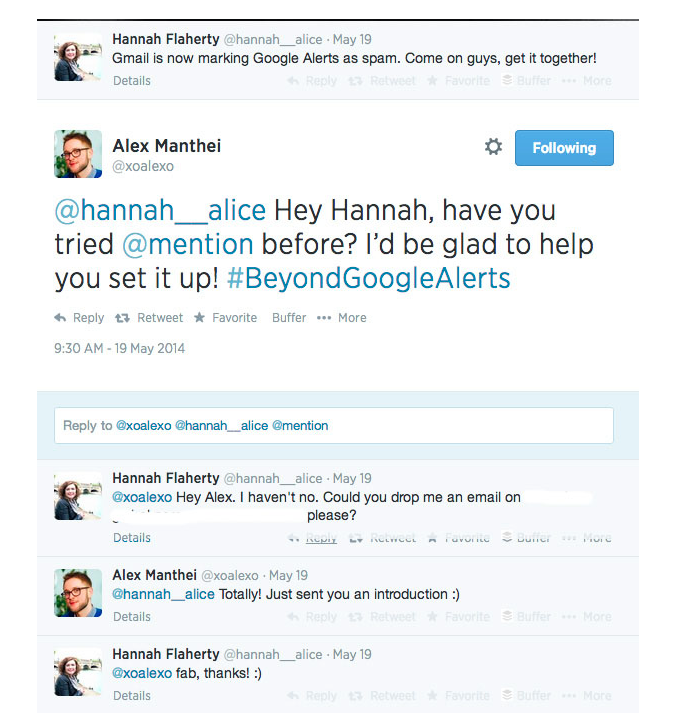 The customer-listening process continued with every proposed feature. If customers valued and were willing to pay for them, they were in. If not, no amount of convincing from Porsche engineers could overrule the end user. The result of all this relentless customer-centric product design? The Porsche Cayenne become the most profitable vehicle not only for its parent company but within the entire industry. Talking to your customers on a consistent basis will help you create products that they will be extremely eager to buy. This doesn’t only work with products. It works in the service industry as well. Tucker Max and his business partner run Book-in-a-Box, a multi-million dollar service-based business that helps busy professionals publish their books. The idea for the business came to Tucker from a conversation he had with a woman (who later became his first client) at an entrepreneur dinner. How do you create customer-centric products and services? Get in the habit of talking to your customers. Log the things they say to you, and look for clues about products and services that could solve their specific problem. Or if you have a product idea in mind, do surveys, focus groups, and user testing. Let your customers help you design a product that you know for sure is perfect for them. It is a beautiful thing when your ideal customers come to you. When they know in advance that you are the one they want to work with. That is definitely the goal you want to aspire to. But most businesses have to work their way up to that point. While you work on establishing yourself as the recognized expert, you’re going to have to go out and do more proactive activities that help fill your customer pipeline. We take this approach at Mention by monitoring the keywords “social media strategy” and “social media tools,” among others and join these conversations in a helpful manner, making ourselves available for any questions. As a result, approximately 20% of our leads have been generated via social media and blog comments. The key to making this strategy work for you starts with spending time where your ideal customers hang out. And then once you find them, make a point to listen to what they are saying, what’s bugging them, what questions they have, or even things they are excited about. When you see an opportunity to be helpful, join the conversation. It may not always be quite as direct as the way it happened in this Mention example, but just opening the lines of communication by adding value to the people you want to serve will begin the process to include you as a potential option to help them solve their problem. This approach works well because you aren’t spamming people with a blanket message to “buy your stuff.” Instead, you’re being human, and offering up solutions to top-of-mind issues your ideal customers are having. As much as we’d like them to be, everything with our products and services won’t always be like a bed of roses. And when things aren’t working quite the way they should, your customers should feel comfortable enough to share their challenges and frustrations with you. Unfortunately, most don’t. That’s why data shows businesses only hear from 4% of dissatisfied customers. The others don’t value the relationship enough to complain, opting to share their frustration with their inner circle instead. Studies show that a bad customer experience is shared twice as many times as a positive one. Ouch! So on the rare occasion that a customer of yours does take the time to express their concerns, you’ve got to be ready with a listening ear. And you’ve got to be poised to take action. That’s what Elon Musk, CEO of Tesla did recently. 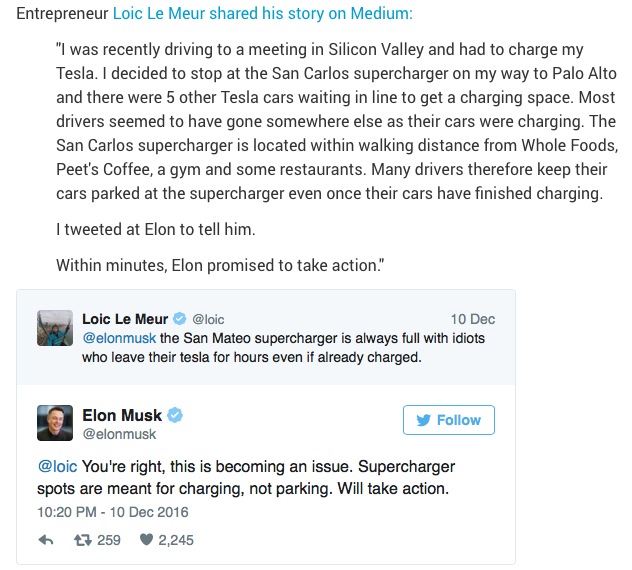 A customer complained directly to Elon on Twitter about not being able to charge his electric car. Elon responded quickly to the complaint and promised to follow-up. And six days later he made good on his pledge when Tesla announced a policy change designed to deter people from leaving their cars at charging stations for long periods of time. The bottom line for you: When your customer complains, see it as a gift. They are opening the door for you to make things better. All you have to do is listen with empathy, and be genuine in your quest in looking for a solution to the issue. Your customer will appreciate that you took the time to address their concerns and that their voice was heard. The data backs this up as well. Studies show that 70% of customers who’ve had a complaint handled to their satisfaction will do business with you again. When you talk to your customers and find out what’s happening in their world, it gives you an opportunity to go above and beyond. It gives you an opportunity to make life better. It gives you an opportunity to delight. The more you know your customers, the more chances you have to make a difference. 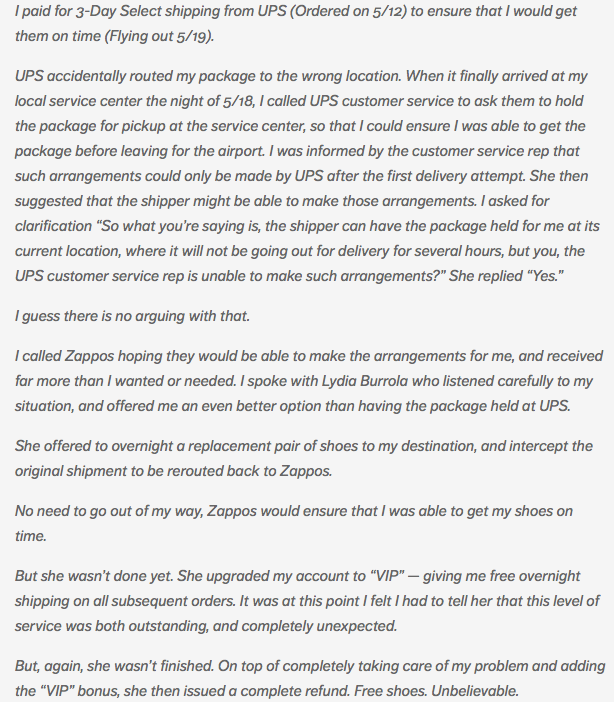 Zappos is a master at this. Their customer service team spends waayyyyy above the industry average on the phone talking to their customers. But this time spent gives them an opportunity to not just talk about shoes and shipping, but to learn the story behind the shoes, why their customers need them, and what it means to them to have them. A customer for life. Pretty sweet, right? What small gestures can you make to make life better for your customers, that will leave a lasting impression? Take the time to talk to your customers more, and you’ll soon realize you’ll have a ton of opportunities to delight, once you start looking for them. Only good things can come from it. You’ll be more in tune to what they need and want from you. They’ll have an opportunity to deepen their bond with you. And you’ll discover a number of opportunities with which to grow your business. Customer intimacy is good for your business. Make it a priority to invest the time in getting to know your customers, and connecting with them at a deeper level. They will appreciate the attention. And you’ll appreciate the results. ‘Win’timacy w/customers. I’ve been in some form of customer service most of my working life. Smoothing ruffled feathers is an art. And talk about turning lemons into lemonade! What better opportunity to do good than to get in tune with what’s bad? “The Chinese have the same symbol for crisis & opportunity”.–JFK. Find problems & solve them. “I Could Be Your Hero”–Enrique Iglesias? Then again, Henry Ford said if he asked potential customers what they wanted, they would’ve said faster horses”. Sonia, I think I get emails & newsletters from practically everyone you’ve featured in your writings. If you mention them (there’s Mention) they must be good. I get that & I’m cool with it. But I’m a dude & you got me wanting to order womens’ shoes from Zappos! And yeah – a complaint is definitely an opportunity to turn lemons into lemonade, I’m sure you are able to do it with flair. Hey Sonia! it’s pretty amazing to have stumbled on your blog today. 🙂 Ma’am, you’ve got a great stuff going on around here. Please keep being a source of motivation and inducing help. Speaking about the topic of discuss, I believe there’s nothing in the world that beat customer satisfaction and I believe too that when customer is satisfied with the solution you’re proffering, they keep coming back…some will invite other people to join them, which is cool for your business growth. I love each of the points you have mentioned here and I will definitely focus more on them from now on. Thanks again for stopping by. Come again!